My family consists of me, my husband and our three daughters. Two of the girls are mine from a previous relationship and one is my husbands from a previous relationship. My kids are half americans so half of their family is living in USA. 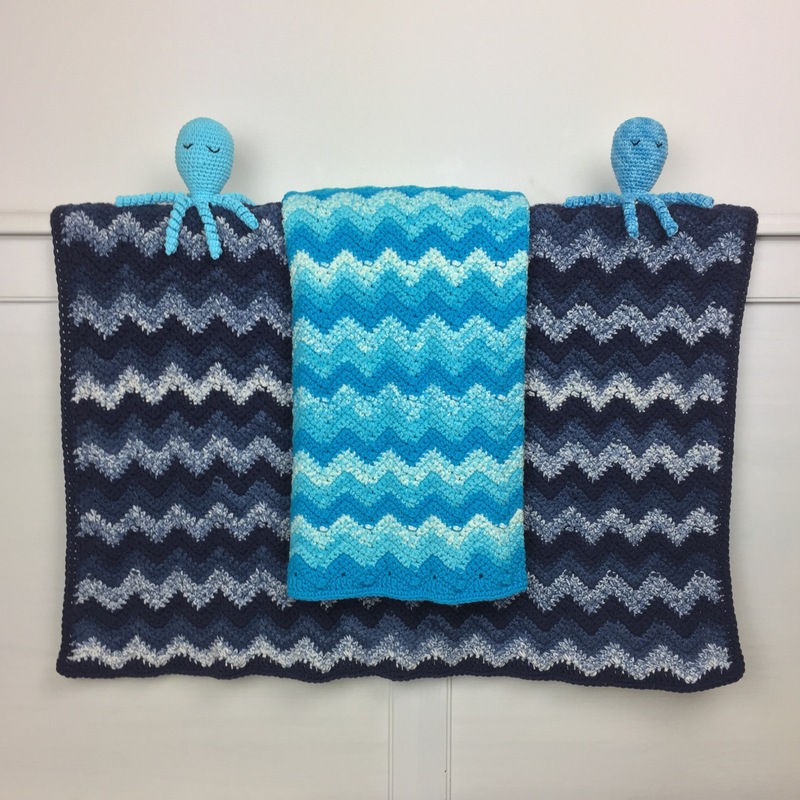 This spring, they will have a new cousin over there, so I have designed a baby blanket that we will send as a baby shower gift. In the picture you can see two octopuses as well. They are my go to gift to make to most newborns around me. They are also used as comforters for premature babys. The octopus arms remindes of how the umbilical cord feels like. This is a super easy patter. The only things you need to know is how to work single crochet and to count to three. For the edging, you need to know half double crochet and double crochet as well, but you can skip the edging if you want to. 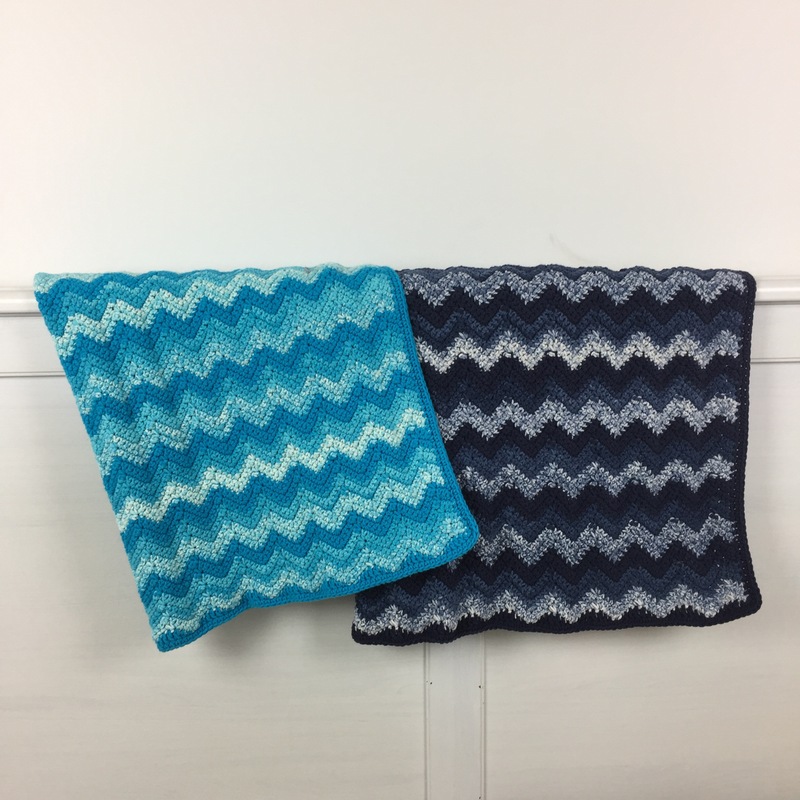 I have made the blanket in two different colour combos, Aqua and Jeans. 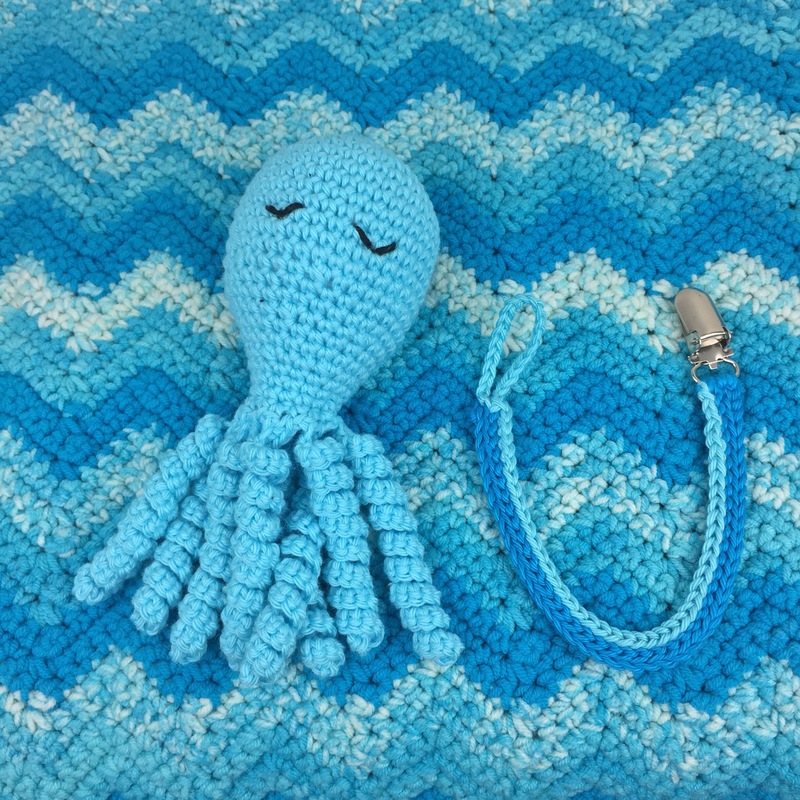 You will start working with colour 2 and crochet three rows. Change to colour 3 and work 3 rows. Change to colour 1 and work three rows. Repeat until you have 114 rows. All the rows end with a turn chain. This does not count as a stitch troughout the whole pattern. End by crocheting the edge with colour 1. Row 1: sc in second ch from hook, sc in next 2 ch, * sc3tog, sc in next 3 ch, 3 sc in next ch, sc in next 3 ch *, repeat from * to * 13 times, sc3tog, sc i next 3 ch, ch1, turn. Row 2 – 113: 2 sc in the first st, sc in next st, * sc3tog, sc i next 3 st, 3 sc in next st, sc in next 3 st*, repeat from * to * 13 times, sc in next st, 2 sc in the last st, ch1, turn. Row 114: 2 sc in the first st, sc in next st, * sc3tog, sc i next 3 st, 3 sc in next st, sc in next 3 st*, repeat from * to * 13 times, sc in next st, 2 sc in the last st.
3 sc in the first st, put a marker in the second st. * hdc, dc in next 3 st, hdc, sc, skip 1 st, ss, skip 1 st, sc *, repeat from * to * 13 times, hdc, dc in next 3 st, hdc, 3 sc in the last st, put a marker in the second st.
2 sc in the first st, put a marker in the second st, sc in next 2 st, * skip 1 st, ss, skip 1 st, sc, hdc, dc in next 3 st, hdc, sc * repeat from * to * 13 times, skip 1 st, sc in next 2 st, 2 sc in the last st, put a marker in the first st.
112 sc, close round with a ss in the first sc. Ch 1, sc in the same st, 3 sc in next st (the one with a marker), sc in all st to the next marked st, 3 sc in next st, sc in all st to the next marked st, 2 sc innertak st, sc in all st to the next makes stitch, 2 sc in next st, sc in all the remaining st, close with a ss. Your blanket is now finished! The pattern for the binkey holder will be uploaded soon. Nästa 🇸🇪 Nytt garn! 🇺🇸 New yarn!